Register Log In ECN Forum Forums NEC & other Code issues Can you paint the front of a receptacle? Question: Can you paint the front of a receptacle if you do not get any paint on the contacts? 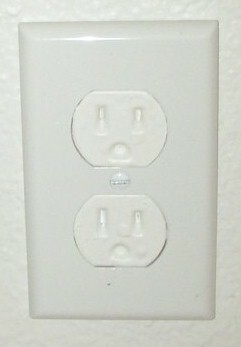 Answer: No, receptacles are not evaluated with paint on the device. "A receptacle which has been painted other than authorized by the file procedure, for example, "Charlie home owner, etc., would no longer be UL Listed. The introduction of paint, especially on the face of the outlet could reduce spacing or form a tracking either line to line or line to ground." In addition, to the potential hazards associated with reduced spacing or tracking, it is possible the paint itself could be conductive. The manufacturer's association says if you get paint on it you have to replace it, imagine that. U/L said "receptacles are not evaluated with paint on the device" so they don't know. My own opinion is that this is a non issue. I find nothing in the UL white book that says we can not paint a receptacle. I have not seen that info in the limited instructions that come with a receptacle. I also think that this is entirely unenforceable which just makes it a joke. IMHO there are more important things to worry about. Take a look at the FAQ's and see the answers given around the country, one of the representatives from Texas is the Chairman of CMP 1 and the other from Massachusetts his alternate, Andre works for UL and Mike is a Midwest Code Guru. You cannot paint conduit. Incidental drips are included in painting. I wonder if they test recepts with the grounds up or down. That would settle that argument once and for all. Joe the link does not appear to offer FAQ at the NEMA site. Are you certain the URL is correct?? Look to the upper left of the page and find these links that will take you to the FAQ area.